As those members who were at the AGM will know there have been a number of changes to the Executive Committee. David Eglise has resigned as Chair of the Society due to personal circumstances, and the search for a permanent replacement for David has commenced. Whilst remaining as Vice Chair I have also taken over from Anne Taylor as Acting Chair, and, on behalf of the Society, I thank Anne for going beyond the call of duty and coming “out of retirement” to lead us as Acting Chair over the last year. We welcome Graham Morley, who has taken over as Secretary from Elizabeth Bye-Jorgenson, and Allan Boothroyd who will be helping us with some important project work. Elizabeth Bye-Jorgensen and Joan Biggs have retired and I thank Elizabeth for giving us such great secretarial support over the years, and Joan for organising the Annual Dinner so brilliantly. We have just completed another tranche of daffodil planting on Bachelors’ Acre to brighten the area up in the spring, and have had the good news that the Blue Plaque for the former Princess Christian Hospital is ready and now awaits completion of the information plaque to accompany it. Both of these are examples of the good work the Society does to protect and promote our heritage and to improve our environment in Windsor and Eton. Lastly, as you will see in the section below, we will be holding our Annual Dinner in The Guildhall on 1st March 2018. This is a real privilege for the Society so please put the date in your diary and apply early for tickets as it should be fully subscribed. By kind permission of Cllr John Lenton, Mayor of the Royal Borough, our Annual Dinner 2018 will be held in Windsor Guildhall on Thursday 1st March. Our Guest of Honour will be Murray Craig, Clerk of the Chamberlain’s Court at Guildhall, City of London, whose role includes conducting the ceremonies for the Freedom of the City of London. It seemed particularly appropriate to invite him this year when we are celebrating in our Guildhall. Tickets are £44 per head. We are limited to 80 guests and tickets will be allocated on a first come first served basis, so please apply early to avoid disappointment. An application form, with further information on the back, accompanies this newsletter. This report covers the planning applications which were considered at the August, September, October and November meetings of the committee. 1 Leopold Place, 140 St Leonards Road – infill of undercroft parking area to form garage – (PA 17/03089) The original planning application giving permission for the construction of the building included a condition prohibiting changes without planning permission. The tendency is for such spaces to be used for things other than cars and eventually turned into living space. This would exacerbate the parking problem. 73 Grove Road – construction of rear dormer to extend existing loft conversion – (PA 17/03554) Although the conversion could not be seen from the road the additional construction was an ugly addition to the existing conversion and was not appropriate for the Conservation Area. 55 Queens Road, Windsor SL4 3BQ – loft conversion with two rear dormers to form habitable accommodation – (PA 17/02716) We did not object to the principle of the conversion but raised concern regarding the proposed modern front velux windows whose design was counter to recommendations in the Conservation Area (Inner Windsor) Appraisal. While the application was approved, our views were upheld. This resulted in a condition being placed on the permission requiring details of the proposed Conservation Area style roof lights to be submitted and approved in writing by the Local Planning Authority, and that the development must be carried out and maintained in accordance with the approved details. The Borough Local Plan 2013-2033 Submission Version, together with supporting documents, was made available to residents and statutory consultees as required by Regulation 19 of the Town and Country Planning (Local Planning, England) Regulations 2012 between Friday 30th June 2017 and 5pm on Wednesday 27th September 2017 (extended from an earlier deadline of 25th August). All representations received during that period will be submitted to the Secretary of State for consideration by a Planning Inspector as part of an independent “Examination in Public”. To this end, the Council will be submitting the BLP prior to 31st March 2018, indicating the precise date in an updated Local Development Scheme (to be published in early 2018). For anyone wishing to look at these documents again, the Regulation 19 documents are available to view on the RBWM’s dedicated portal and on its website. Further information can also be obtained by contacting the Planning Policy Team on 01628 683000 or email blp@rbwm.gov.uk . Charles Knight Grave Area A meeting was held with the RBWM Landscape Officer, Ambika Chouhan, and we are now clearer about the arboreal work to be done. Hopefully this will begin fairly soon. Responsibility for this project has now been assumed by Allan Boothroyd, our new Executive Committee member. Chariott’s Place Several members have expressed their pleasure having seen the refurbishment of Chariott’s Place. We are very grateful that at a meeting with RBWM officers at the site we were able to stop the planned red tarmac and feel that the result is much more in keeping with the area. There is still planting to be done and the brick commemorating the wedding of Prince Charles and Lady Diana Spencer will be re-sited in a central feature. The Windsor Neighbourhood Plan Forum held its AGM on Wednesday 1st November at the Smiths Lane Baptist Church in West Windsor. A report from the joint chairs Claire Milne and John Bastow updated Forum Members on progress. Following the public consultation on the draft plan, it had been submitted for independent peer review. This process had identified a number of issues which the Committee now needs to address including reducing the overall length of the plan and arranging to carry out a Strategic Environmental Assessment. Additional technical help has been requested to take account of the requirement for an SEA which it is admitted will cause some delay in finalising the plan and might necessitate a further public consultation. Yes, that is the new name which has been given to King Edward Court shopping centre. We were taken aback and wrote to the owners Aberdeen Asset Management (AAM), the site managers Jones Lang Lasalle, councillors and the press to express our objections to this sudden change for which limited consultation was given. Unfortunately it is a done deal and there appears to be nothing that we can do about it. We will be meeting AAM to discuss the matter further. We discussed a briefing paper produced on behalf of Salmon Harvester Properties who are the owners of the former Imperial House site in Alma Road. The proposed redevelopment plans for this site include a mixture of commercial and residential buildings. In outline, the plan is comprised of a smaller office complex plus high-rise residential apartments for rent. We await the planning application but our first impressions are that the new proposal is unduly overdeveloped with some of the buildings being seven stories high, which is considerably higher than the current planning permission. A visit to the Royal Library has been arranged for Tuesday 6th March 2018 at 2.30. The visit usually lasts about 90 minutes. The cost is £25. Following on from the requests of several members after our Annual Dinner 2017 we are privileged to have been given this opportunity. 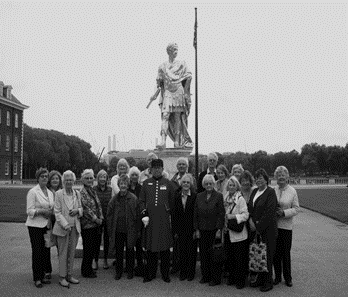 The visit is for a maximum of 24 members and is ONLY for members of The Windsor and Eton Society. An application form is enclosed with this newsletter. After a reasonable journey and the good fortune of our coach being able to park in the grounds, there was time for us to look round the grounds before having lunch in the café, where some felt it was even warm enough to eat lunch al fresco. Our guided tours began in the Visitor Centre where we met Albert and Brian, our two Chelsea Pensioner Guides. We were shown a short and interesting film the about the history of Royal Hospital and then started our tours which included the buildings designed by Sir Christopher Wren for the Royal Hospital’s Founder, Charles II. These buildings were intended to house all army pensioners in a single quadrangle known as Figure Court. –The gold statue in the picture is of Charles II and both the Chapel and the Great Hall are in surrounding buildings. The Chapel is very ornate with the painting of the Resurrection in the half dome of the apse by Sebastiano Ricci, plasterwork by Henry Margetts and wood carving by Master Carver William Emmett. The Great Hall has a large mural at the far end representing Charles II on horseback, begun by Antonio Verrio and completed by Henry Cooke and is also lined with portraits, amongst them ones of George II, George III and an equestrian portrait of the Duke of Marlborough to name but a few. In 1686-88 James II added the Light Horse Court and College Court, both also designed by Sir Christopher Wren. One of our members visited The National Army Museum and was pleased that she was able to see what goes on behind the barrack walls of the Victoria and Combermere Barracks, the display of soldiers’ kit, the variety of sports offered, and a section on the nutritional breakdown of rations for campaigns from Waterloo to the present day. The Museum also acknowledges the part women play in the modern army. The 37 members who took part in this visit all agreed that they had had an excellent day. In 1838, the 3rd Earl of Carnarvon commissioned Sir Charles Barry to transform his home into a grand mansion which would impress the world. In many ways Highclere Castle epitomised the confidence and glamour of the Edwardian period in the first few years of the twentieth century. During the First World War, Almina, the 5th Countess of Carnarvon, transformed the Castle into a hospital, and patients began to arrive from Flanders in September 1914. The Castle returned to a private home and in 1922 the 5th Earl and Howard Carter discovered the tomb of Tutankhamun. During the Second World War, the Castle briefly became a home for evacuee children from north London. Highclere Castle was used as the home of the Earl of Grantham in Downton Abbey. Set in the beautiful Wiltshire countryside and home to the Earls of Pembroke since the 1540s, Wilton House is first and foremost a family home and has been for over 450 years. Since 1544 when the buildings and land were granted by Henry VIII to Sir William Herbert, Wilton House has been inextricably linked to the political and artistic circles of England. The magnificent state rooms at Wilton designed by Inigo Jones include The Single Cube Room and The Double Cube Room the great room of the house. The House also has a world famous art collection by renowned artists such as van Dyck, Pieter Brueghel and Rembrandt. With over 22 acres of parkland and gardens, bordered by the rivers Wylye and Nadder, the Grounds are perfect for visitors to explore. It was a pleasure to welcome Richard Snailham again when he gave our September talk on The Art and Architecture of Ethiopia. Ethiopia was one of the earliest nations to adopt Christianity and members found it particularly interesting to see and hear about the monolithic rock-cut churches which have been hewn out of the ground. Few members had visited this country but there were a couple of former residents in his audience who particularly enjoyed reminiscing. Our October talk was given by one of our long standing members, John Handcock CVO, DL, LLB who spoke about the Chateaux of the Loire Valley. John and his wife have visited this area many times and his talk was illustrated by both his own and professionally taken slides, particularly of the exteriors and the gardens. The November talk on The Experiment: Amy Buller: The Royal Family and Cumberland Lodge was attended by over 60 people and celebrated the 70 years of Cumberland Lodge as an educational foundation very appropriately. Canon Dr. Edmund Newell, informed us of the work of this amazing person and her strength of character, determination and ability to be able to work her way to the top to set her ideas in motion. She was able to get people in the highest positions to talk to each other, especially Germans and British at a crucial time in the 1930s and she continued to encourage young people to discuss issues of the day. There are many parallels in the world today so it was also good to hear of the talks and discussions that regularly take place in Cumberland Lodge, many involving students from countries all around the world. Susan Ashley will talk on Doris Mellor and the Battle for Bachelors’ Acre, a period in Windsor’s recent history that many members will remember. ARE YOU ABLE TO HELP WITH . . . . . . . Your committee believe that we can improve communications with members and the local community through our website and also by embracing modern Social Media techniques. We are looking for someone who can help us with enhancing our website content and who can communicate on Social Media – Twitter, Facebook etc. If you, or someone you know, has these skills and might be prepared to help us, please contact any Executive Committee member for further information . The 71st AGM of the Society was held in Upper School, Eton College, on 23rd October 2017. Our President, Sir James Perowne, chaired the evening, which was attended by about 70 members. Anne Taylor, the retiring Acting Chair, gave a comprehensive account of the Society’s events and activities during the past year and also summarised the achievements of the Society during 2016/17. She expressed her appreciation for the support of all members of both the Executive Committee and the Heritage and Environment Committee, and noted that the number of active members remains encouraging. Treasurer, Chris Simon, reported that the Society is in good financial health. Chris Aitken was re-elected Vice Chair and becomes Acting Chair following David Eglise’s resignation as Chair. It was explained that a new permanent Chair is being sought and will be appointed by the Executive Committee in due course. Graham Morley was elected Secretary, replacing retiring Secretary Elizabeth Bye-Jorgenson, and Joan Biggs also retired from the Executive Committee after many years of service. The remaining Executive Committee members were unanimously re-elected, and Allan Boothroyd was elected as a new member. Presentations were made by the Executive Committee to both Elizabeth and Joan to thank them for their fantastic work for the Society over so many years. Chris Aitken also added his thanks to Anne for continuing to fulfil the role of Chair for the extra year and for her excellent leadership of The Society. He also expressed the Society’s best wishes to David Eglise and his wife. The meeting then welcomed Martin Denny, the Director of Windsor Festival, who gave an overview of The Festival and an update on the plans for The Old Court (previously The Firestation), the Council owned Arts Centre which has just reopened under the direction of Martin Denny Management Ltd. The evening concluded with light refreshments. Following changes to the Committee would members please amend the contact details for the Chair and Secretary printed on the back of your blue 2017/18 Programme Cards so that these are up to date. The newsletter is available in an electronic form and members are asked to give their permission to receive it in this format, thus saving the Society a considerable amount of administration costs. Information on this can be obtained from the membership secretary. The Annual Report and Programme Cards are still sent to members by post. Members are also asked to advise the Membership Secretary if they have changed their email address as information about future events and any changes that may be made are sent out electronically. Upton House School, 115 St Leonard’s Road Windsor SL4 3DF .